Last month we put a picture of Jack Corley on the cover of the paper… I neglected to put a caption on that picture saying “Next Month” a story about Jack Corley. I got a few calls asking why did you put a picture and on the cover? “I looked all through the paper for the story and there isn’t one.” I laughed it off and made a couple lame excuses about it being a nice picture of Jack and that Jack is a good guy and long-time supporter of R & R NW. Well Jack is a nice guy and the picture in lasts month issue was a good picture and representative of what you’ll find at swap meets all over the Northwest throughout the year. He is a hard-working vendor helping old car enthusiasts from all over, to restore, rebuild, refurbish their old cars, me included! Jack has been in the parts business longer than some of you reading this have been… He started in parts/sales in Portland at George Lawrence Co. Warehouse back in 1955. He moved to a manufacturers rep. with Niehoff in 1956 where he worked for just a few days/weeks short of 20 years. He’s been in the automotive/race car world before that. Starting in 1953 working for Ed Tonkin’s Motors, a Kaiser dealership, on then named, Union Avenue in Portland. He simultaneously operated a “race car performance parts, side hustle” business, called Jack’s Specialty Speed starting in 1956 featuring race car stuff. He even built and rented complete race cars to racers and he bought and sold race cars too. Through his travels as he came across “excess inventory” at dealerships he would buy that inventory. Car manufacturers limited what and how much a dealership could return in terms of parts. Speaking from experience, I once was the “parts manager” at a dealership, the OE manufacturer seemed to make it as difficult as possible to return parts, I think in an effort to discourage returns. That’s just my opinion. This practice created an opportunity to acquire OE parts and Jack took advantage of it. He also bought out aftermarket parts stores excess inventories. Jack would load these buys in the trunk of his car which was often overloaded and take them home where he eventually built a 15,000 square foot building to store and inventory the stuff. Essentially, he ended up with what I’ll call a “Parts House,” specializing in old, maybe obsolete, primarily “hard parts.” And he called it Jack’s Specialty Parts. For about 10 years Jack would hold a “Swap Meet” in the backyard parts paradise. They had a Friday night, movie night, camp out, the night before the swap meet. Unfortunately, I never attended, mostly because I was simply unaware, too bad. It sounds like that was a lot of fun. In about 1999, Jack “retired”… well, he started selling parts from this parts house full time. About 10 years ago he moved to his currently location at 909 NE Cleveland Ave., in Gresham. If you never been there you should go visit him. 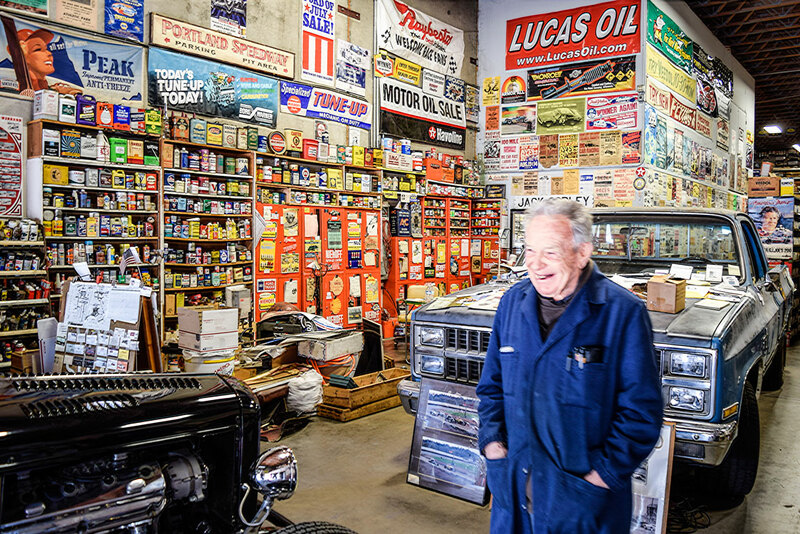 Over the years he has collected way more than a few auto-related, what I’ll call memorabilia pieces and they decorate many square feet of the walls of his “store.” Jack tells me that he had to down size considerably, that part of his business when he moved. If you’re looking for hard parts for your latest rebuild of your treasured old car, you have an old car parts house as close as your phone. Jack has many years of experience in parts to help you make that treasure as good as it can be. Give him call at 503-667-1725, or visit him at 909 NE Cleveland Ave. in Gresham, OR.